Ralphie May - Otter Productions Inc. | Otter Productions Inc. Ralphie May - Otter Productions Inc. 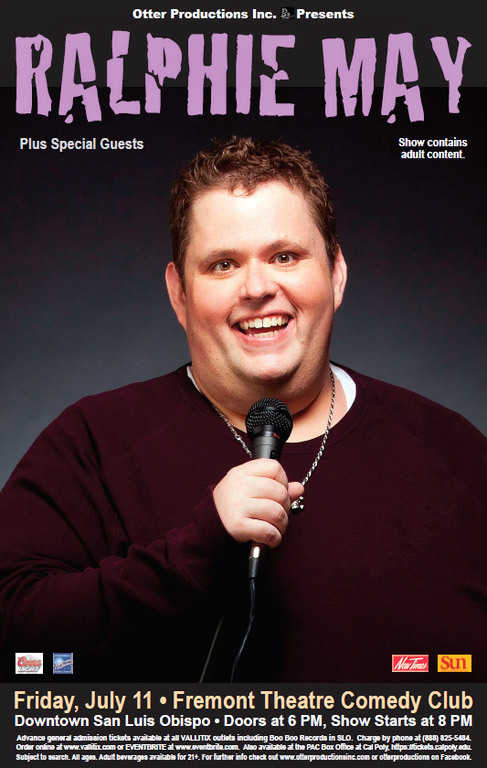 Otter Productions continues with the FREMONT THEATRE COMEDY CLUB with Ralphie May and special guests on Friday night, July 11th at the Fremont Theatre in downtown San Luis Obispo. With the goal of bringing world class comedy on a regular basis to the classic downtown SLO art deco theatre, Otter Productions welcomes Ralphie May in his debut SLO performance! When San Luis Obispo’s Fremont movie theater opened its doors on Memorial Day 1942, the star-studded premiere drew celebrities such as boxer Max Baer and comedic duo Stan Laurel and Oliver Hardy — along with hundreds of servicemen stationed at nearby Camp San Luis Obispo and Camp Roberts. Now, 70 years later, comedy returns to the iconic Fremont Theatre with The Fremont Theatre Comedy Club and Ralphie May. Voted one of Variety’s “10 Comics to Watch” in 2008, Ralphie May has filmed a record-setting three separate 1-hour Comedy Central Specials in the past three consecutive years, all of which were among the networks most highly-rated. He’ll be filming a new special on October 1st at the Pabst Theater in Milwaukee, proving that Ralphie’s relatable comedic genius is in higher demand than ever. When he’s not on the road, Ralphie divides his time between Nashville and Los Angeles with his beautiful wife Lahna, their two wonderful dogs Pimp and Hoochie Mama, and their two children, April June May and August James May. He contributes much of his time and energy to helping others. Since establishing a residence in Nashville, he has been actively involved with the 100 Club of Nashville, various youth organizations and the Humane Society. ADULT MATERIAL! 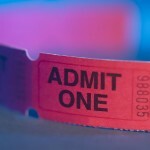 Advance general admission tickets ($30 plus handling fees) are on sale now at all VALLITIX outlets. Charge by phone at (888) 825-5484, order on line at: www.vallitix.com . Also available at eventbrite.com and on the Cal Poly Campus at the PAC Box Office and polytix.com. LIMITED VIP TICKETS ($50 plus handling fees) AT VALLITIX ONLY AND INCLUDE PRIORITY SEATING UP UNTIL CURTAIN AND A MEET AND GREET WITH RALPHIE MAY.